DSLR cameras and other advanced cameras have acquired the ability to shoot not only still images but also take high-definition (HD) video. This feature allows a user to switch from shooting photos to videos with the flick of a button and it can be great fun. The HD video option has really opened up the possibilities of a digital camera. With a DSLR, a vast range of lenses are available that can be used to interesting effects and the resolution of modern DSLRs allows for broadcast quality video. There are, however, a few things that you need to know in order to get the most out of this function. There are many different file formats available for video recording. Canon DSLRs use a variation of the MOV file format, Nikon and Olympus cameras use the AVI format, and Panasonic and Sony use the AVCHD format. Don't worry too much about this, as all videos can be translated into different formats at the editing and output stage. Most of the new prosumer and top-end DSLRs can record in full HD (equal to a resolution of 1080x1920 pixels) at a rate of 24 to 30 frames per second (fps). Entry-level DSLRs can often only record at the lower resolution of 720p HD (a resolution of 1280x720 pixels). This is still twice the resolution of DVD format, though, and makes for exceptional quality. Although a DSLR has more pixels available than this only a few TVs - 4k or UHP (ultra high definition) - are capable of playing a higher quality video than 1080p HD. DSLRs use this function to record HD video. The camera's mirror is raised and the viewfinder is no longer usable. Instead, the picture is streamed directly to the camera's LCD screen. Because shooting videos require the camera to be in Live View mode (as noted above), the mirror will be up and autofocus will struggle and be too slow. It is best to set the focus manually when shooting video to ensure accurate results. When shooting video, your range of options for shutter speed and aperture will obviously become narrowed. When shooting video at 25 fps, for example, you will need to set a shutter speed of around 1/100th of a second. Any higher setting and you risk creating a "flick-book" effect on any moving subjects. In order to give yourself access to the full aperture range, it is best to play around with the ISO and to invest in an ND filter. 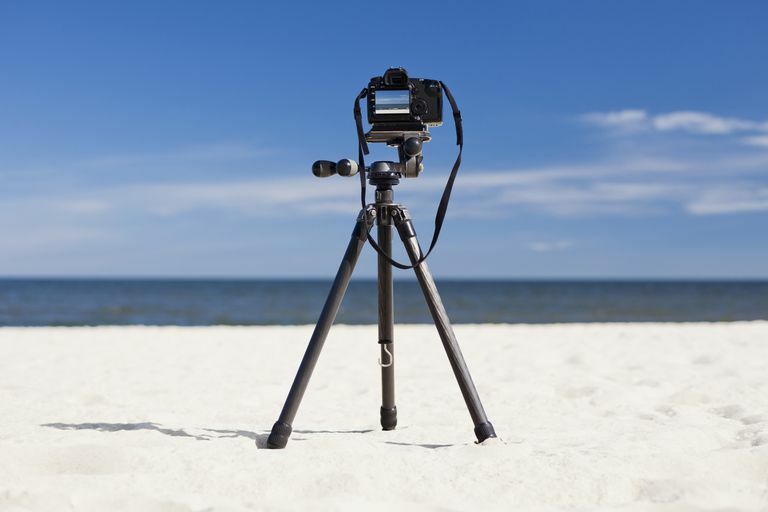 You may want to use a tripod when shooting HD video, as you will be using the LCD screen to frame the video. Holding the camera at arm's length so you can see the LCD screen will likely lead to some very shaky footage. DSLRs come with a built-in microphone, but this only records a mono track. In addition to this, the proximity of the microphone to the photographer versus the subject usually means that it will record your breathing and any touch of the camera. It is far better to invest in an external microphone, which you can get as close to the action as possible. Most DSLRs provide a stereo microphone socket for this purpose. Don't forget that you can take advantage of the vast range of lenses available to DSLR users and use them to create different effects in your video work. Conventional camcorders often have built-in telephoto lenses, but they usually lack decent wide-angle capabilities. You can make use of different types of lenses, such as a fisheye (or super wide-angle), to cover a huge area. Or you can take advantage of the narrow depth of field offered by even a cheap 50mm f/1.8 lens. There are lots of possibilities, so don't be afraid to try a variety of options!